It’s my birthday today (August 1) and I’m saying good-bye to 23 – it was a very weird, up and down kind of year. Hello, 24 – I hope you’re a good year. I’m freaked out, people. But assomeone gently reminded me the other night, it’s too late now to worry about it! 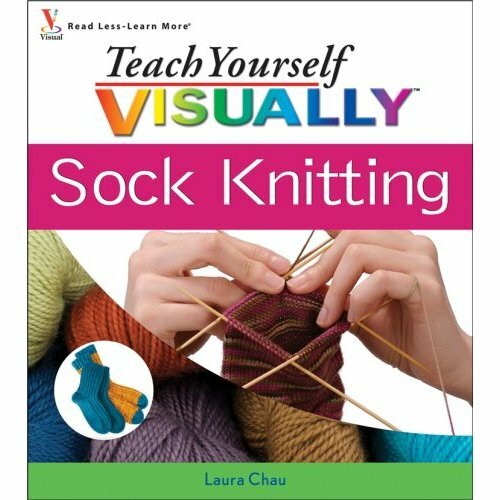 So all I can say is, I hope there are still knitters out there who want to learn how to knit socks, need a new sock reference, want some new sock patterns (there are a dozen of ’em), or, y’know, just want to buy my book! Both pairs of shoes have gone to new homes, and I bought another pair of Fluevogs, in red of course! They’re having a huge sale – I had my eye on those shoes already, but then they were 30% off! Can’t beat that. I’m rather boring these days what with the working, but I’m counting on some much-needed crafting time this weekend. I really want to make some new skirts, maybe a top or two as well. I did manage to sew up an infinity dress for a friend this evening, using a gorgeous chocolate bamboo jersey – I even learned a few things from the first time and it came out super! I’ll try to get a photo in the morning. Being at the sewing machine again did give me a little bit of a kick – it’s so fast and gratifying. Must. Sew. To those emailing about the Baby Thermal pattern, I’m hard at work on it. The Baby version (up to 2 years) is pretty well done, but the Child/Youth version (up to size 12) is still on the needles. Soon, soon. I really want to get it done and out there! 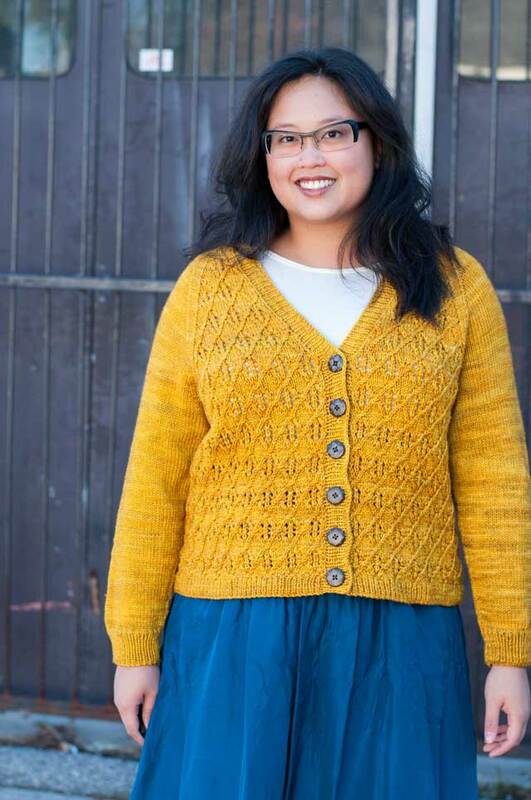 In other super-random knitting news, I just realized that the party for my newly-arrived cousin/niece (the daughter of my cousin…first cousin once removed? niece is easier) is early next week and I have not knit a stitch! I’m going to try and bust out a quick little sweater and hat, so there’d better be some finished projects on this here blog soon! 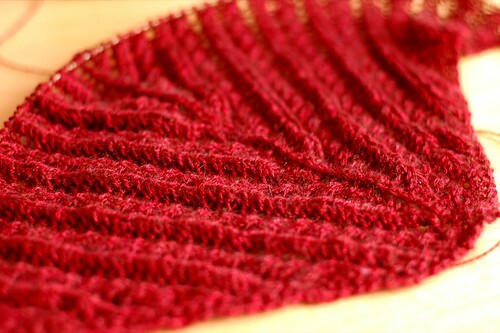 I’ll leave you with a beauty shot of the Mooi shawl I’ve been working on – it’s darker than in this photo, but so luminous. There will be no yellow jersey for me this year! I’ve totally failed in my attempt at the Tour de Fleece. Well, to be fair, I did set my sights rather high – recall this photo. I’d estimate that I still have at least a pound of fiber left – and I’ve been spinning hard, dudes. Today (Friday) was the first day off I’ve had since last Monday, and every day that I was at the store, I spun on one of the store wheels. 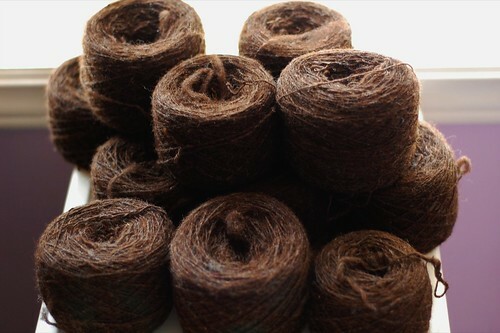 I made quite a dent in the last week, really, especially with the Woolee Winder…but I’ve still got more fiber! It’s like the neverending fleece. That there photo is of 13 balls of various weights, since several (4) were done on a Louet, which has a huge bobbin. I did spin a bit today and managed another bobbin’s worth, and I might be able to spin another tomorrow. But that still won’t bring me quite all the way. And then there’s all the plying to do. I’m not that deterred, really, because I still want to finish up this project! It feels like I’ve devoted so much time to it that it would be stupid to stop now. I’ll be spinning until it’s done! After the spinning and plying (I’m going to do a three ply), then comes some knitting…I’m thinking a coat-type sweater, maybe in a dense, flat stitch like a herringbone. I could even sew a lining or something. It’s going to be a lot of yardage, so I’ll have options!